for a beautiful sunset at Water Cay. “Conch? Wish you’d told me earlier. I cleaned 150 of them this morning,” George told us when we dinghied up, inquiring about the gargantuan mollusk. 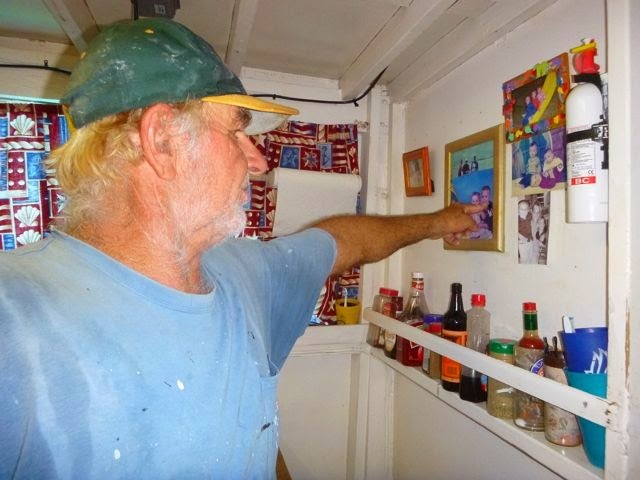 George welcomed us aboard Lady Marie, his commercial fishing boat. We anchored next to him in Water Cay, Jumentos. While relatively well provisioned for the remote Jumentos and Ragged Islands, our hope was to supplement the holdings of our miniscule freezer with freshly caught fish, lobster and conch, especially given it was quite possible we’d be unable to access any non-perishables other than what we brought with us from for 1-2 months. We figured in a less populated area increased the odds of accessing nature’s bounty. But we’re still greenhorns when it comes to living off the land. and a half of meat. Turns out George is friendly with cruisers, though we got the sense they didn’t ask for lessons. He wanted to excavate the conch for us, using his trusty claw hammer. We don’t have one of those, so we stopped him and asked if he could help us figure out how to do it with our ball peen hammer and a particularly robust standard screwdriver and new, long sharp fish knife. George shrugged his shoulders and pitched in. He demonstrated on the first conch, explaining the knocking is between the second and third row of node from the conch spire (top) to create enough of an opening to access the ligament that holds the conch in it shell. 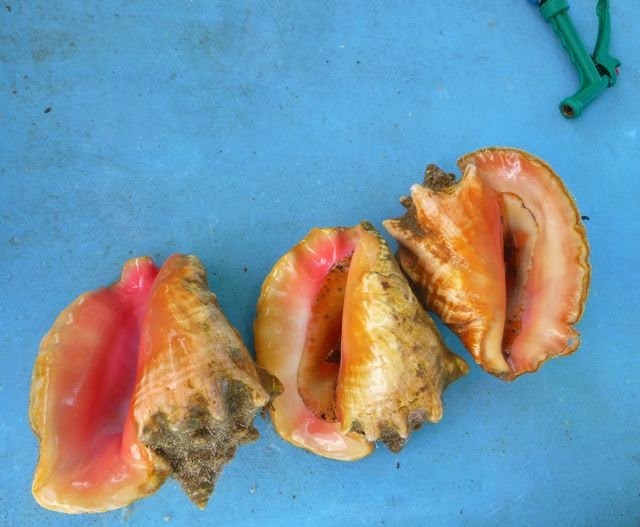 The next step is to slip a knife into the hole and sever the ligament, so the conch can be pulled out of the shell by its hard claw. George’s eyes got big when I pulled out my fishing knife. “No!” he exclaimed. “You just need a butter knife.” George pulled out a small knife. With a cut and a claw yank, out it came. From there, George again waved away my fish knife, instead using his buck knife to complete the final surgery, cutting away the eyes, guts and tough conch skin. 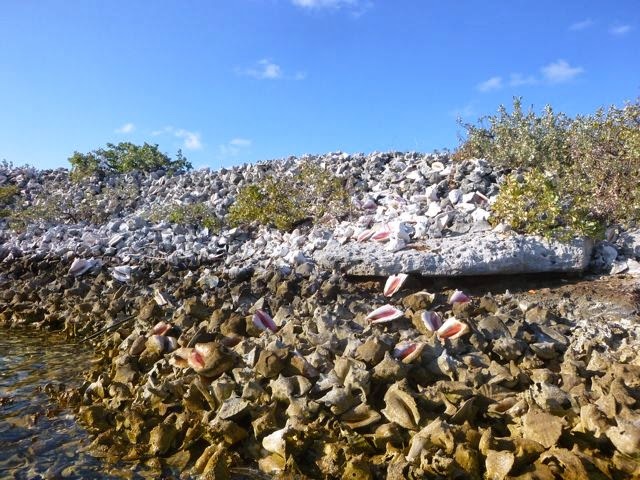 Conch midden (pile o’ conch shells) at Water Cay. That’s a LOT of conch! I insisted on tackling the second conch. “Yeah, my wife thought she could clean conch too,” chuckled George. Pathetically, I attempted to hold the conch and center-strike the rounded end of our screwdriver handle with our hammer. George determined he needed to hold the conch in place. Then he needed to keep my screwdriver affixed to the correct sopt without slipping. Then he took the screwdriver and the hammer and created the opening, just to assure himself it was do-able, which, of course it was. I tried again…. Again, George finished it. We all concluded conch cooking would be Galley Wench Tale duty, but conch cleaning would fall to Wayne. 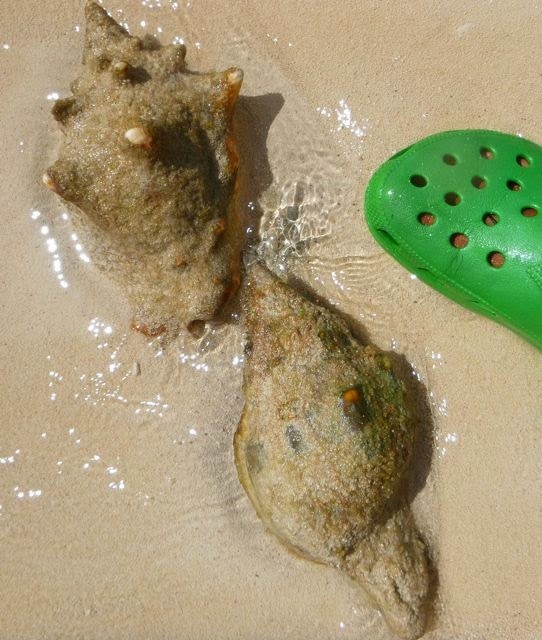 Eventually I hope to be able to tackle it once the conch body is removed from its shell…. And perhaps a claw hammer might magically appear in Wayne’s toolbox in the future, At that point I’d consider trying again. Lady Marie, awaiting excavation lessons. “Do you eat barracuda?” I asked George, bummed about tossing ours back. “No,” he replied. 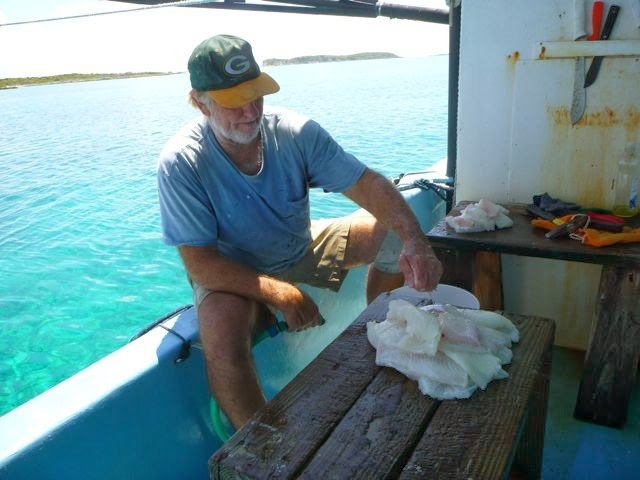 “We keep catching them,” I explained and we’re not sure what to do about it.” “Do you like hogfish?” George responded. “I’d be happy to try it,” I said indicating to Wayne to pull out his wallet. George gave us two generous hogfish fillets, and a small lobster tail, too. He refused payment or any other thanks than our boat card. 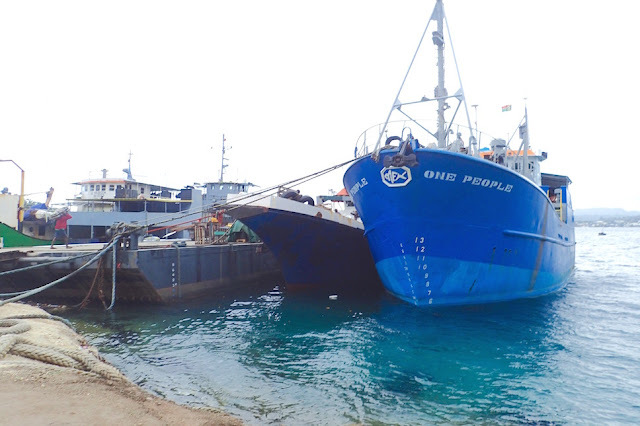 “Want to see what a commercial fishing boat looks like?” We took George up on his tour offer. We promised to look George up when we got to his home island of Eleuthra later this spring. 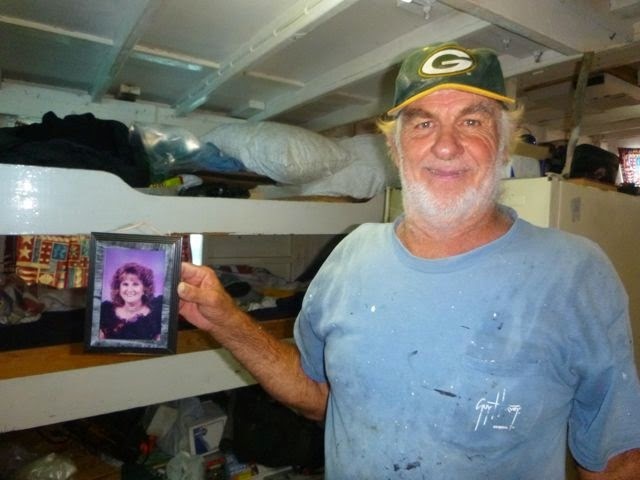 He gave us his wife’s email, “If you can find her, you can find me,” he said with a smile. of his smiling wife, Linda Marie. 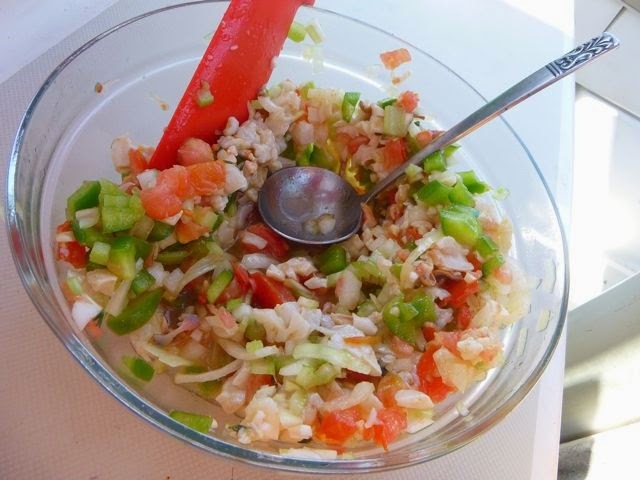 Fortunately my first attempt at conch salad was far more successful than my conch harvesting, excavation and prep. It was every bit as delicious as the conch salad I ate four days in a row in Potter’s Cay, Nassau. I rubbed the hogfish with minced onion and fresh ginger, then steamed it (recipe from Scott & Wendy Bannerot’s “The Cruiser’sHandbook of Fishing), cooking the lobster tail in the steaming water. Then I flash-fried the hogfish in a skillet with a little hot peanut oil, and served it all up. It was one heck of an anniversary dinner! 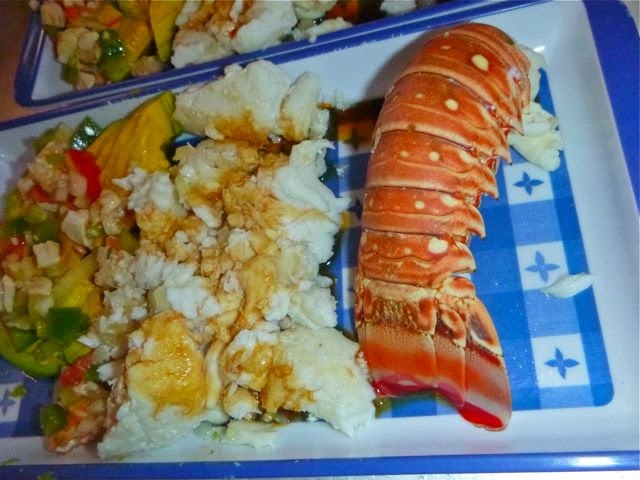 In fact, we were unable to finish the hogfish or attempt the lobster that night. The leftovers made a perfect base for brunch the next morning, gluten crepes with béarnaise sauce. George didn’t know it our anniversary, though I’m sure it would please him to it. this summer, after a three-year absence. 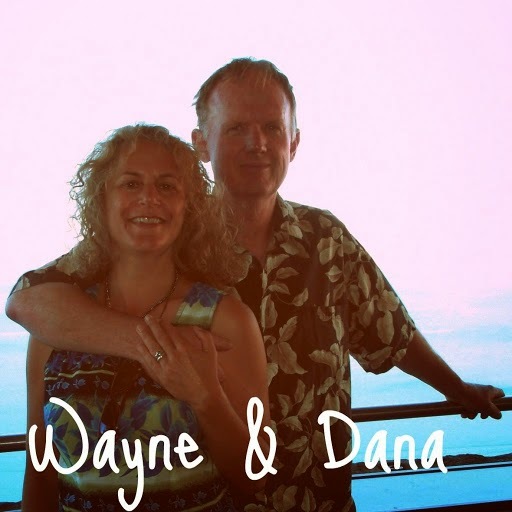 “We are the recipient of so many acts of kindness,” Wayne reminisced that night, a tad watery-eyed with gratitude. We are alternately touched, grateful, and feeling a bit unworthy of so much generosity. We are also inspired to tip the balance -- to find ways to pay it back and pay it forward. 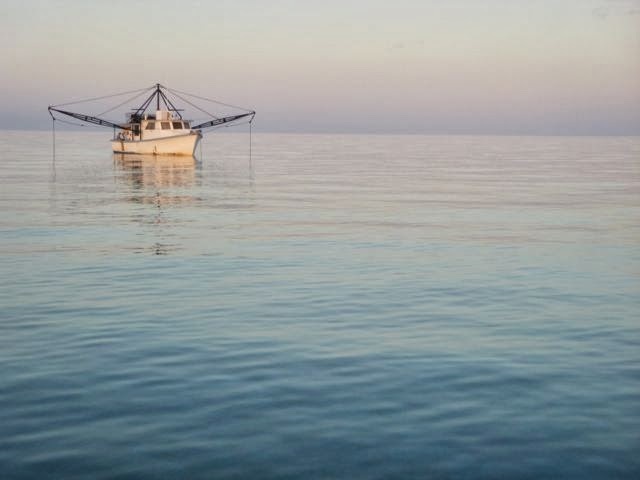 We observed that same kindness later that eve and the next morn, as George checked in on us, warning us Water Cay was not a safe place to stay for the forecasted winds. “If it gets to 25 knots, With gusts, they may clock 50 knots. Waves get up to 8-10 feet in this anchorage. You’ll wind up on the rocks! Don’t stay here!” He left at first light, radioing us while underway. this mound of fillets in seconds. The powerboater next to us, Pay Day, demonstrated that kindness again, supporting a neighboring sailboat, Allegra, who needed a tow back to Georgetown, a two-day trip. Allegra’s propeller shaft broke; it would take a haulout to repair it. Georgetown was the nearest haulout facility. George, thank you! We hope to meet you and your lovely wife in Eleuthra. Also, thank you Milltown Sailing Club (especially Slavic and Walt), Matt Keller (who co-owned our first sailboat with), Seattle Women in Boating, Gary in St. Lucia, Lili and Tomaz of Heron, fellow Pearson owners, Allen and Michelle of Incommunicado, too many folks to thank on the Pearson forum, Marc Blackburn of Nivana, Scott and Kim of Bella Blue, and Ron and Dee of Ursa Minor and of course, Wayne’s Dad. Honestly, we’re not sure how to thank you all enough for taking us under your wing. Galley Wench Tales made. Yum! March 31, 2014, BAHAMAS. Currently we’re in Hog Cay, Ragged Islands near Duncantown. (N22.14.920 W75.45.106). This is a retrospective from our first stop in Water Cay, the Jumentos (N23.017.48 W 75.42.996) where we sailed 42 nm from Thomson Bay, Long Island. hogfish and lobster tail. Thanks George!